Need a little summer jacket for an event or just something to wear over your shoulders to keep a chill off? Let me introduce you the new Ivy Brambles Fleurette Lace Jacket made with only two skeins of Ivy Brambles 2-Ply Cashmere shown in colorway Natural White. This little jacket is perfect for evening wear, over a sun dress, in an office with air conditioning, as a little extra for a special bride or even for a special nursing mother! We had lots of ideas when we saw this jacket and we all love it! 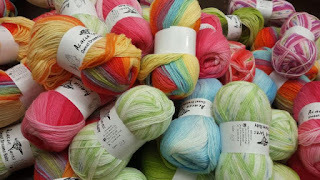 Lots of demand for more colors of the Ivy Brambles Merino Roving in both 4 oz and 1 oz packaging! It's arrived! Whether you spin or needle felt, this roving is pure gorgeous! New colors in today including Day the the Beach, Fall Leaves, Lilacs, Red Tide, Ocean and Celosia! These new colors join with the many colors we carry and each colorway is unique!